Following the success of the Casco Bay Islands SwimRun event over the last three years, race organizer SwimRun USA looked to expand, deciding to bring this unique team competition to the Northwest corner of the United States. 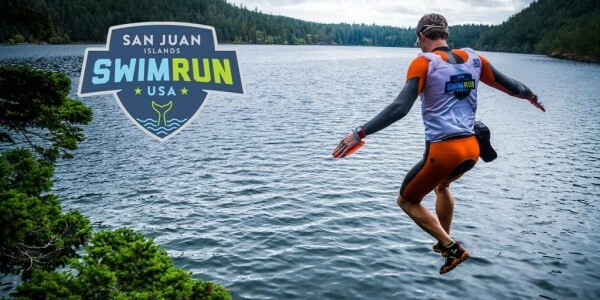 The inaugural San Juan Islands SwimRun promised an endless array of trails, views for days and crystal clear mountain lakes. For many of the participants and spectators, especially those from the Pacific Northwest, this would be their first taste of this emerging sport. Did it hold up to the promise? SwimRun USA's Lars Finanger chats with athletes at the pre-race briefing. On September 22, athletes convened on Orcas Island, the largest of the San Juan Islands, an archipelago in Washington state. To get there is an adventure in itself: An hour and half drive from Seattle to the seaside town of Anacortes puts you on a ferry which provides access to the stunning San Juan Islands. For a more scenic route, some opted to take a float plane which provides ample Instagram worthy photos. Orcas is a charming island: empty 2 lane roads, small restaurants, and Moran State Park, an outdoor oasis encompassing over 5,000 acres of trails, lakes and rolling hills. Nestled in the park is Camp Moran, a rustic collection of a lodge and bunk houses. This is the staging area for the San Juan Islands event, which kicked off the following day. Inspired by the international swimrun race series ÖTILLÖ (island to island), originating in Sweden in 2006, San Juan Islands SwimRun is primarily a two-person team event - not a relay, teammates race the entire course together. Rules permit swim aids such as hand paddles, pull buoys, wetsuits and even swim fins, if you’re so inclined. Certain safety gear is mandated by race rules, and hydration and nutrition is highly encouraged. What one starts with, so too must they finish with. Changing from trail shoes to swim fins, or tending to awkward gear can chew up valuable time. Having the right teammate and equipment can make all the difference on course. Race director Brent Molsberry talks through the course. The long course featured roughly 21 miles of trail running and 3 miles of swimming broken up over 25 different sections: 13 runs and 12 swims. With over 6,000 feet of vertical gain, the long course distance is truly an epic odyssey! For those less inclined (no pun intended) there is a short course option for teams and a solo division. As the official wetsuit sponsor of SwimRun USA, we were pleased to see the introduction of this event in our own backyard. We sent a team out to Orcas to compete, spectate and take in the atmosphere of this new sport and we caught up with some friends after the race to get their feedback. Athletes suit up the morning of the race at the lodge. Long-time blueseventy employee, ambassador and professional athlete Guy Crawford traveled up from Boise, Idaho to compete in his first swimrun event. He teamed up with blueseventy Brand Manager Mike Orton and they would go on to finish 2nd overall in the long course division. Orton, a main figure in the formation of the Alliance SwimRun suit had accumulated significant experience running and swimming in a suit during the development phase of the Alliance, but had never raced this long or strenuous of a swimrun event. Team blueseventy Alliance was made up of Mike Orton and Guy Crawford. Kate Bevilaqua, a professional triathlete, made the trek to Orcas with Guy to compete in her first swimrun event as well, but while Guy and Mike have known each other for years, Kate was partnered with an athlete she had never met before. Kate's partner was Lauretta Bailin, a veteran of Lars’ Casco Bay event. The ‘Lethal Ladies' finished 1st in the Female Team division and 5th overall. Kate Bevilaqua and Lauretta Bailin jump into one of the many swim sections. The pair of Steve Quinn and Max Long are no strangers to swimrun, having traveled to Switzerland last year to compete in the challenging ÖTILLÖ SwimRun World Series event in Engadin.